SSG Alex Viola died November 17, 2013 of wounds sustained when his unit was attacked with an IED while on dismounted patrol in Kandahar, Afghanistan. Alex was born in the suburbs of Long Island, New York in 1984. In 1993, when Alex was 9 years old, the family relocated to Keller, Texas as part of a job transfer. Shortly after moving he became ill with an unknown virus that attacked his muscle system. This mysterious illness took control and in a short time he became very weak, his muscles began to atrophy, and even walking short distances became a chore. The weakness continued for nearly a year before he began to show small signs of improvement. As Alex continued to regain strength, he pushed himself, beginning with riding his bike, then moving to roller blades, and over time he improved enough to join a local roller hockey team. He later signed up for the Keller Ice Hockey team where he became captain, proving that his perseverance and determination could carry him to every goal he set for himself. After graduating high school in 2002, Alex went on to the University of North Texas to pursue a degree in Mechanical Engineering and begin his dream of becoming a member of the US military elite. After graduating with honors in 2006, he was accepted into Navy OCS in Newport, Rhode Island. While there he received the OCS Medal of Honor award and then was immediately accepted into BUDS (the Navy SEAL qualification program). After months of rigorous qualification exercises, he was seriously injured just two days prior to “hell week” and was unable to complete the program. Not one to give up on his dreams, Alex ultimately made the decision to transfer to another branch, setting his sights on becoming a member of the US Army Special Forces as a Green Beret. Knowing this meant sacrificing his commission as a Naval officer, as well as half his salary, he chose to begin the grueling process of Special Operations training. SGT Viola joined the Army National Guard in June 2009 and began Special Forces training in April 2010 at Fort Bragg, North Carolina. Alex successfully completed all the necessary training, graduated as a Green Beret in June 2011, and continued on to get his Combat Dive certification. SSG Alex Viola was 29 years old from Keller, Texas. 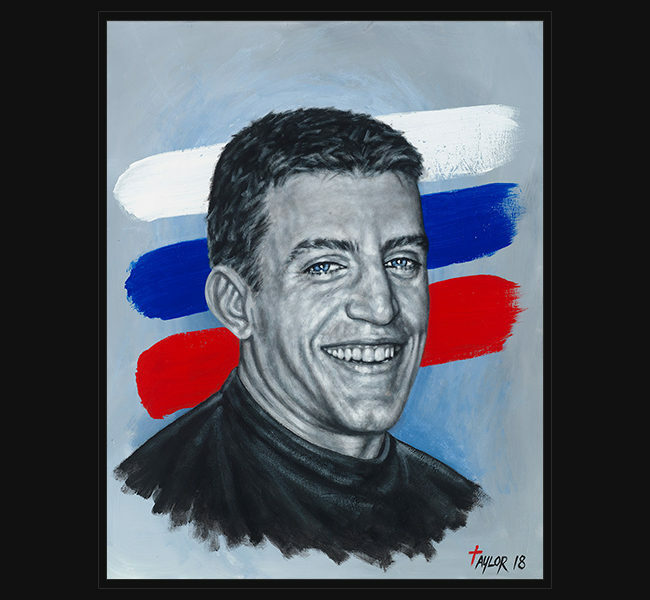 The original portrait was presented October 27, 2018 to his parents, Frank and Peggy, during a special memorial ceremony hosted by the Airpower Foundation and in partnership with American Airlines and Sky Ball XVI.